I can’t say that you can absolutely taste the stout in it, but there is certainly a resonant, ferrous tang which I happen to love. The best way of describing it is to say that it’s like gingerbread without the spices. Here’s the basic recipe, but do drop by and read the way Nigella has written it… What a goddess. She writes about food so lovingly, encouraging you through each step with gentle understanding. I don’t know how she manages to bring a sensual frisson to the simplest of acts, but by the time you’ve reached the satisfying conclusion of one of Nigella’s recipes you may feel the need for a post-coital cigarette. Preheat your oven to 180 degrees (C) and grease and line a 23cm cake tin. Pour Guinness into a large saucepan – add butter cut into smallish cubes. When butter has melted, mix in cocoa and sugar. Beat sour cream, eggs and vanilla in another bowl, then whisk into the chocolatey mix. Finally mix in the flour and bicarb and pour batter into prepared tin. It’s a very wet mix, so don’t freak out and feel like you have to add more flour. The final cake will be very dense and moist, that’s just how it is. Bake for 45 minutes to an hour… Mine took a bit over an hour for a knife to come out clean. As it cooks your kitchen will assume the most heavenly smell. Once done, let the cake cool in the tin, then carefully turn out onto a flat plate/platter and ice it. Icing: use electric beaters or a processor to beat the cream cheese smooth and blend in the icing sugar (sift to get rid of sugar lumps). Add the cream and beat to a lovely smooth consistency. 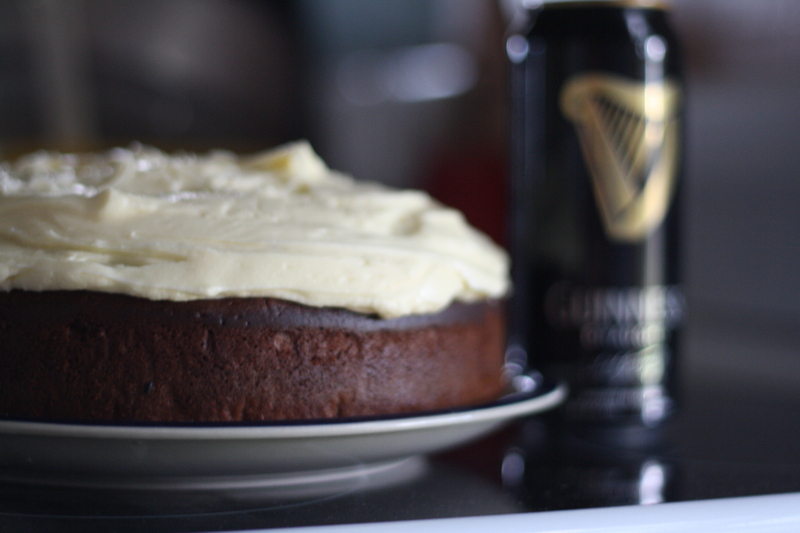 Try not to eat it all before you ice the top of the cake to look like a frothy head on a pint of Guinness.